The life you dream about begins with a home you love. A new home you will love is waiting for you at Stoneybrook Manufactured Home Community. When you are ready to fall in love stop by and inspect our newest model home by BonnaVilla. 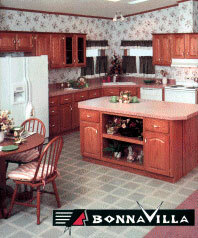 For more than 28 years, the name Bonnavilla has been a symbol of superior quality and craftmanship. You will find each and every new Bonnavilla comfortable and inviting. Not only will you find that BonnaVilla homes are beautiful and superbly built, you will find them to be exceptionally affordable as well. Now also available are quality homes made by Fleetwood. Fleetwood, one of the nation's largest homebuilders, has been manufacturing quality homes since 1950. Check out Fleetwood.com for more information on their housing range. Stoneybrook also offers a limited selection of, ready for move in, pre-loved homes. To view current listings, click here or call us today. We also have our Property Plat available for you to view. Let us help make your dream come true at Stoneybrook! We have arrangements with several financial institutions that are interested in financing homes in our community and will submit an application to each for you.